AMHERST — Wildwood School kindergarteners and Principal Nick Yaffe, sat in a circle Thursday around a hole in the ground where an apple tree was about to be planted. Ryan Harb, coordinator of the permaculture program at the University of Massachusetts, who carted in two semidwarf apple trees, asked the children if they had ever eaten apples. Every hand shot up. “The reason we came here and want to plant this apple tree is that we’re really passionate about growing food, so we wanted to give you an opportunity to grow some food with us,” he explained. They shook out the dirt from the sod that Harb and his colleague, Tripper O’Mara, had dug up. One child found a large worm, and as his classmates gathered around to look at it, Harb explained that the worm had to go back in the hole to help break down organic matter in the soil. 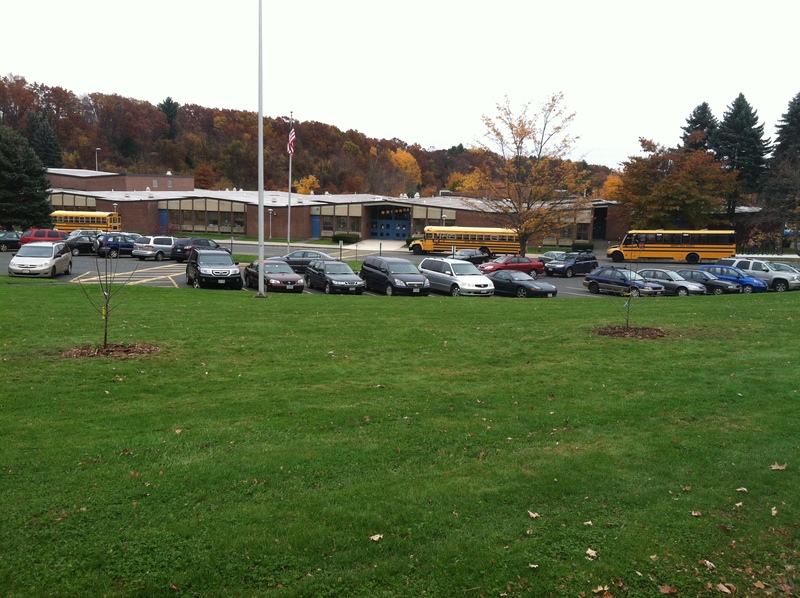 The two trees, one a Macintosh and the other a Yellow Delicious, were planted 30 feet from each other on the green space between the school building and Strong Street. This is to be the site of a permaculture garden next year. Thursday’s planting was the inauguration of a partnership between the Amherst public schools and the Stockbridge School of Agriculture at UMass. 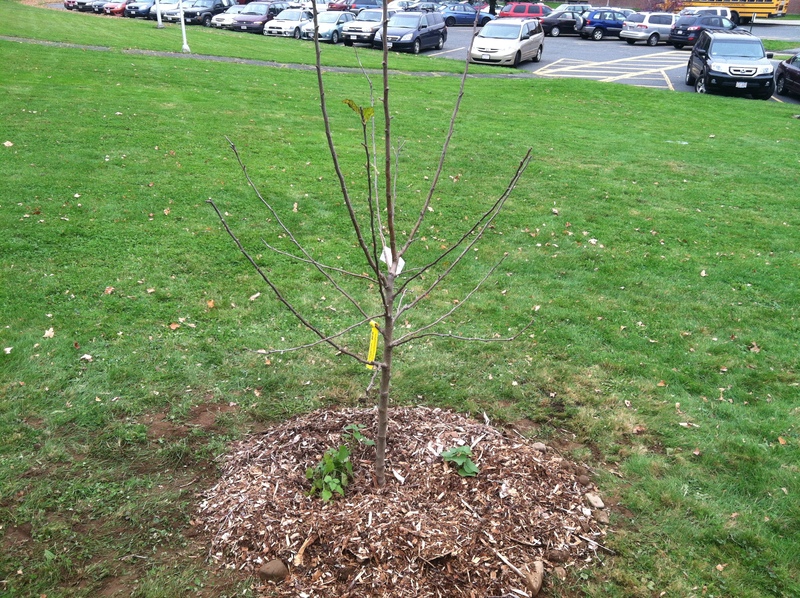 Today, Harb and O’Mara are bringing apple trees to plant at Amherst’s two other elementary schools. 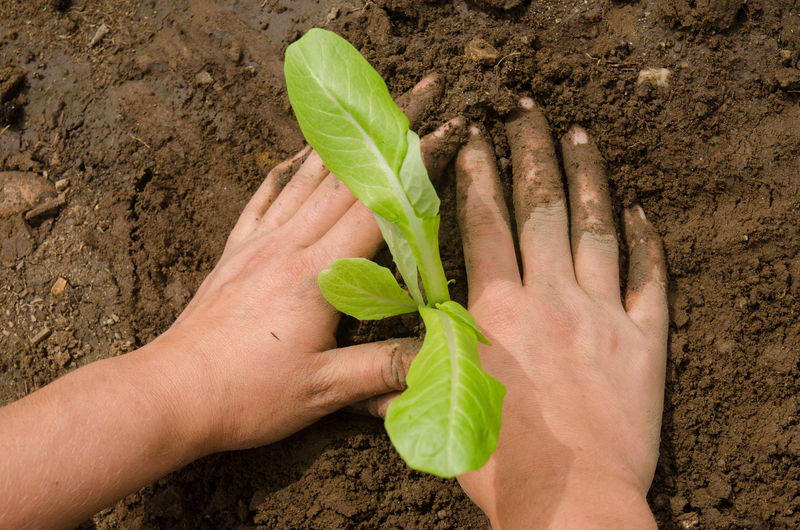 This winter, they plan to help the schools design their gardens, which will be planted in the spring. The ultimate goal is to have the schools grow some of the food that is served in their cafeterias, Harb said. A good model is Leverett Elementary School, where parents have constructed a garden and greenhouse, and each class grows different crops in designated beds and the project is integrated into the curriculum, he said. Harb supervises a quarter-acre garden outside Franklin Dining Commons at UMass, and it grows over 1,000 pounds of food a year to serve to students. The program won national recognition this year, including a trip to the White House in March, and about 50 other campuses have contacted him about starting their own permaculture gardens, he said. He received a grant from UMass to extend his work beyond the campus, and proposed starting school gardens in a meeting with Superintendent Maria Geryk, who supported the idea. Meg Rosa is a Wildwood parent who is on a committee planning the school’s garden. She said many families have said they’re willing to help weed and water the garden during the summer when school is not in session. Wildwood School has children from all over the world, and one option is to use the garden to embrace multiculturalism by planting crops that are popular in their countries of origin, said parent Vivian Liu. Yaffe said he isn’t sure how viable it is to produce food for the cafeteria, but it would be fun for the children to eat food from the garden. Next winter, Harb and O’Mara will help the schools decide what crops to plant, how big the gardens should be, and how to get water to them. They’ll talk about whether the apple trees can be grown organically, whether to start compost systems, how to get the food into the cafeteria, and what to integrate into the classrooms.